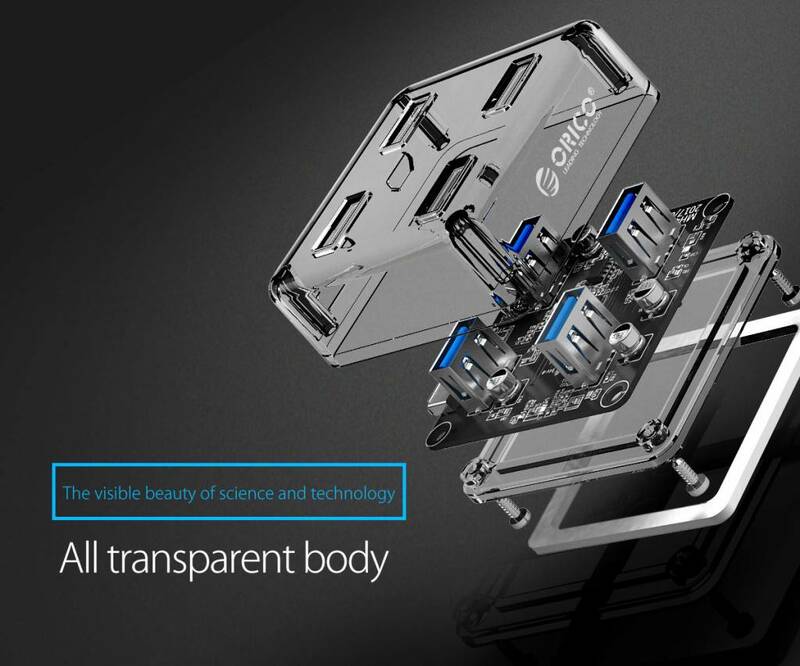 Create four additional USB3.0 type-A ports with the modern transparent Orico hub. 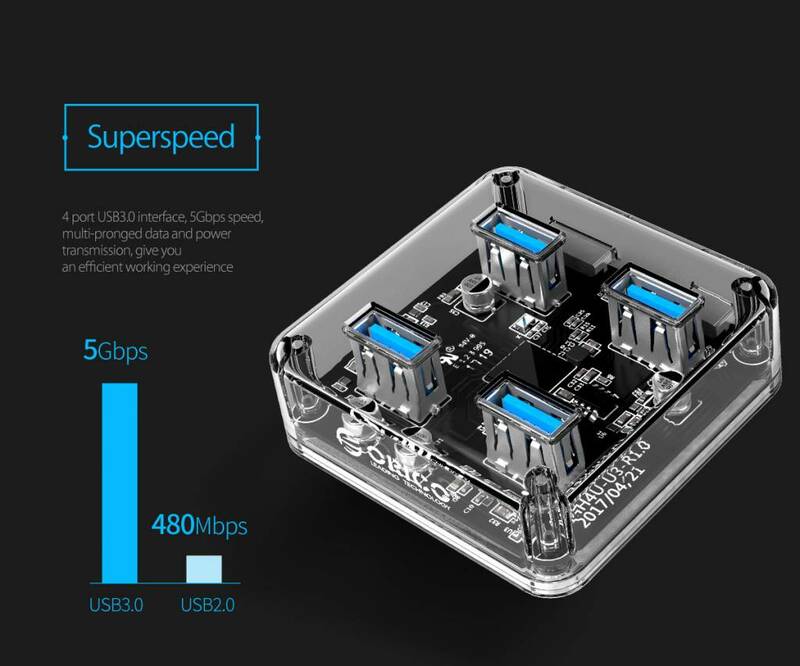 Enjoy extra USB3.0 connections, a unique transparent design and a transfer speed of up to 5Gbps. 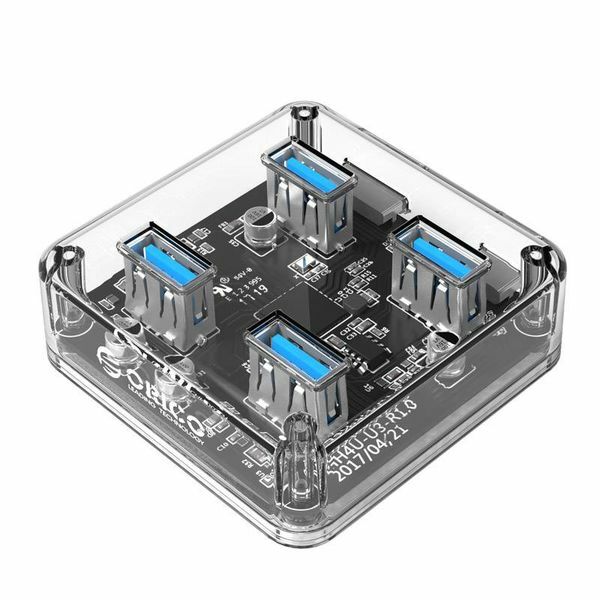 Do you have a lot of peripherals but too few type-A USB3.0 ports? And do you want to easily create these ports with a unique product? Then the transparent hub with four USB3.0 ports is what you need. You can easily connect the hub to your desktop or laptop using the supplied Micro USB3.0 datacable of 30 centimeters, after which you can connect your peripherals. 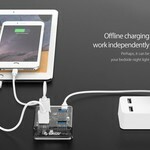 For extra power supply you can connect your Android or other micro USB cable to the hub and the socket. Thanks to the USB3.0 technology, the modern transparent hub can achieve transfer rates of up to 5Gbps with four type-A ports. This is no less than ten times faster than the transfer speed of USB2.0. 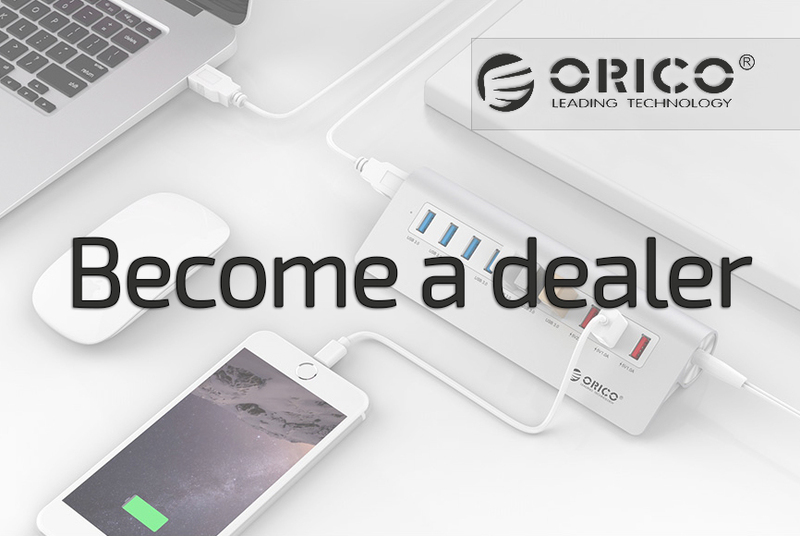 The Orico USB3.0 hub is equipped with a mini-processor. This is also called an intelligent VL817 chip. 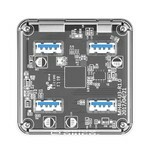 The chip ensures that the ports do not become overloaded during use. 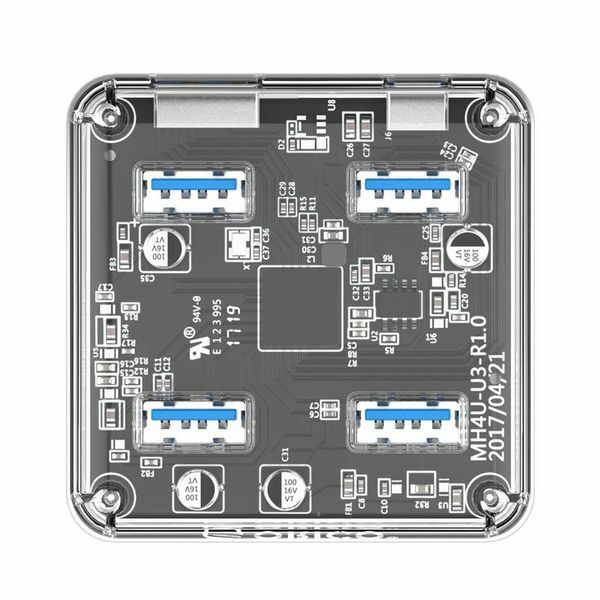 Partly because of this the hub will function optimally and achieve high transfer speeds. 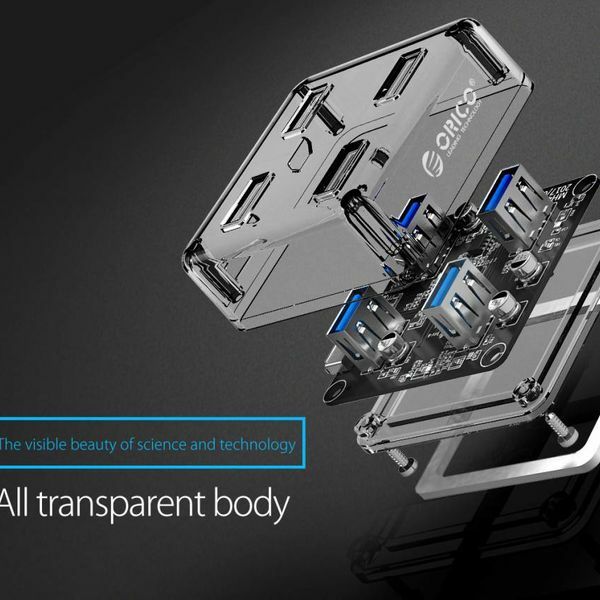 Very unique about this Orico hub is that it is transparent. 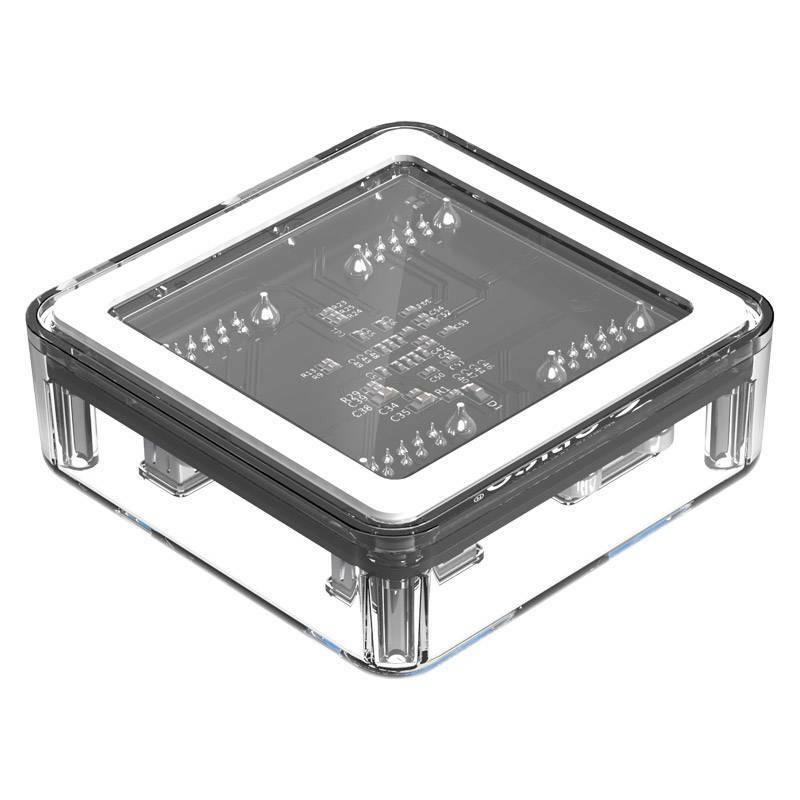 This allows you to see all components such as the VL817 chip and the printed circuit board. 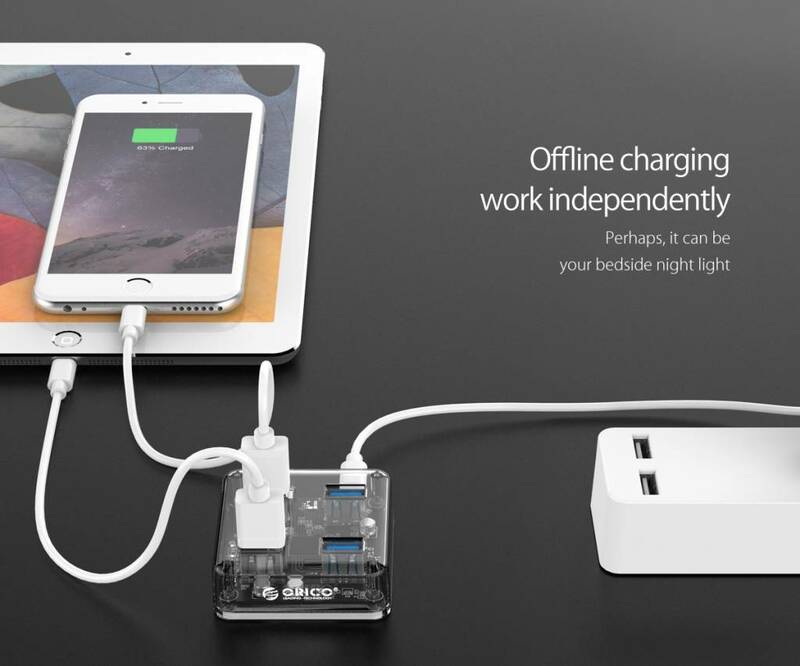 It is very cool to place the hub on your desk. The product has anti-slip material on the bottom, so that it stays in the right place. 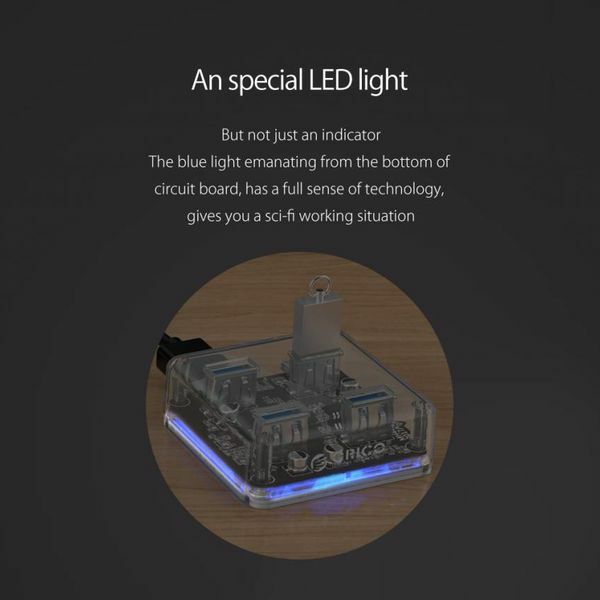 At the bottom there is a special LED indicator, which lights up completely blue when the hub is connected. The entire edges at the bottom are thus illuminated. 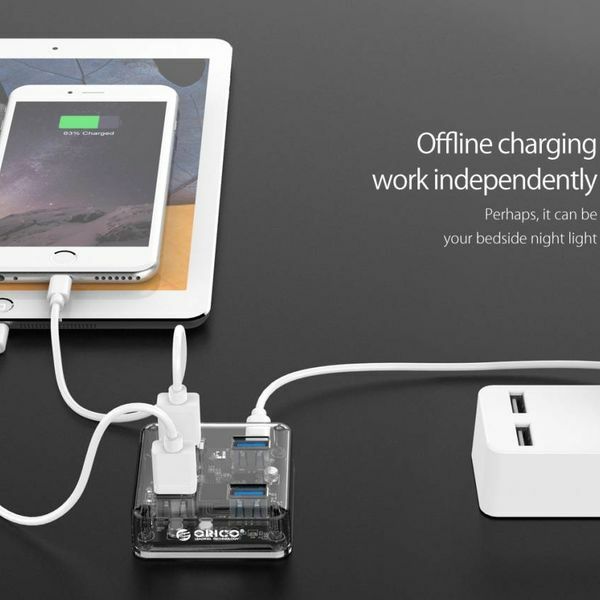 This creates a Sci-Fi work situation, which is very cool. 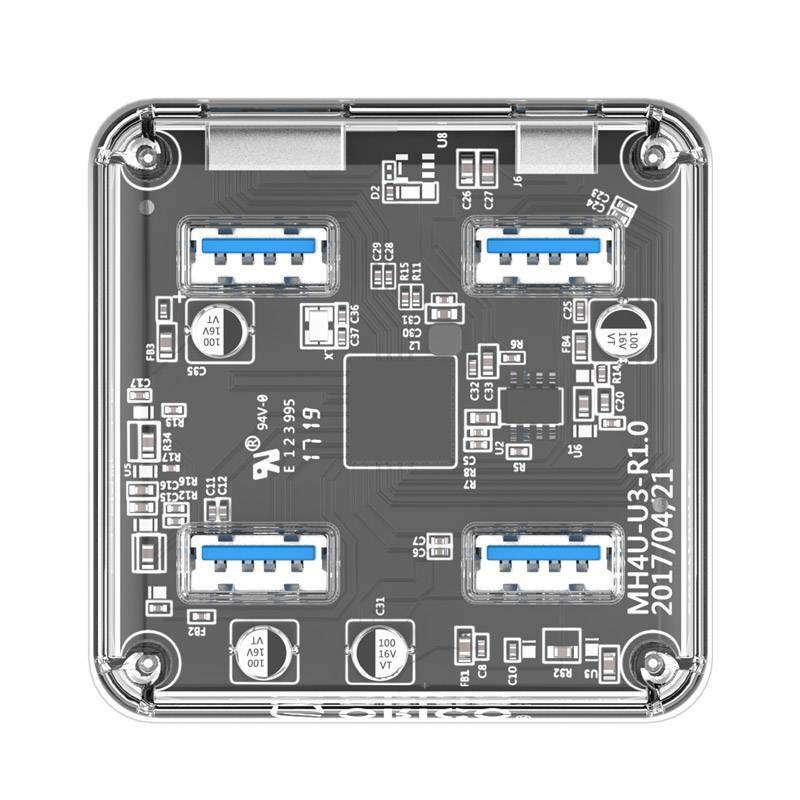 The transparent four-port hub is compatible with all Windows versions, Linux, Mac OS and Chrome OS. It supports peripherals, such as a keyboard, mouse, printer, USB stick or music boxes. The product works without a driver. The hub is well secured. This is due to the multi-safety security system, which will prevent leakage current, short-circuit, overheating and overvoltage. 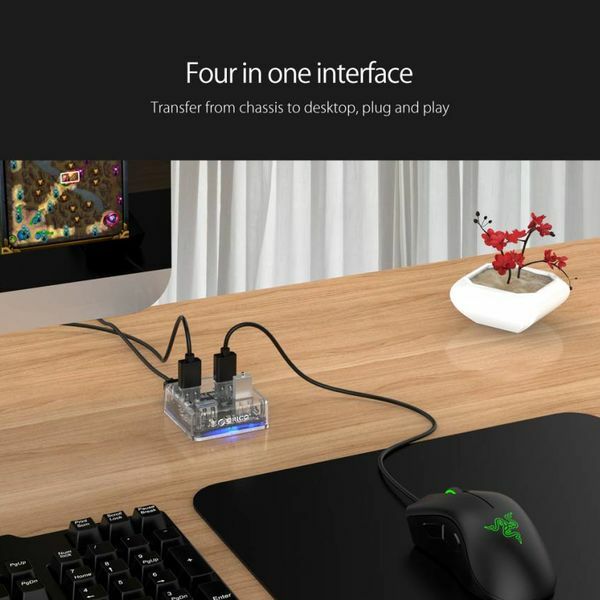 So you can safely connect multiple devices to the hub at the same time. The transparent PC (Polycarbonate) material is sturdy and heat resistant. 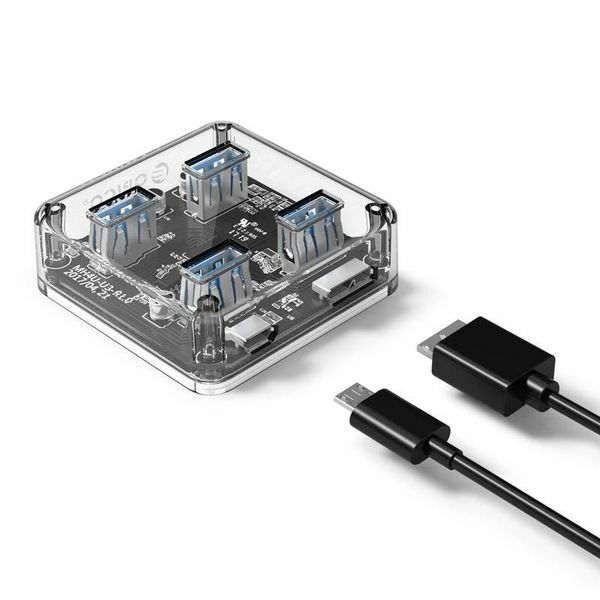 ✔ Output: 4x type-A USB3.0. 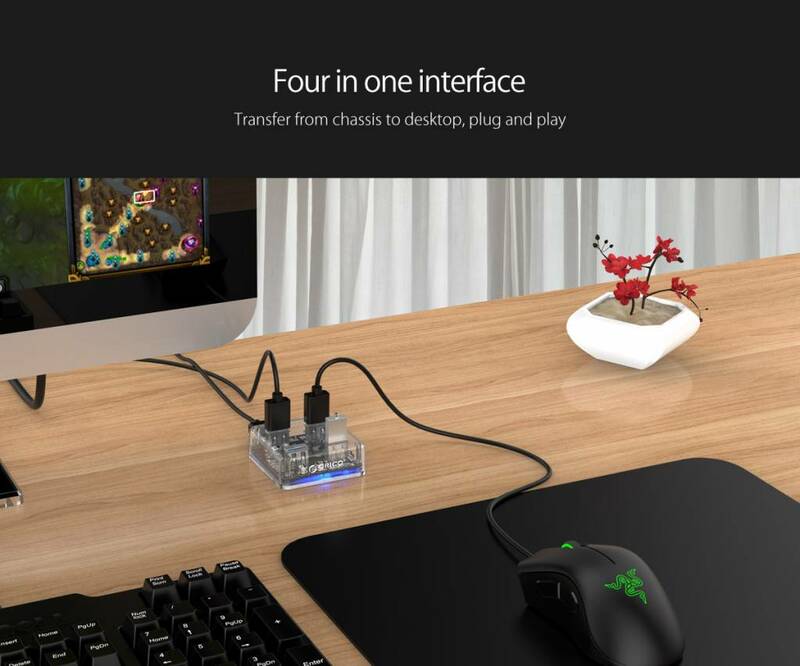 ✔ Input: 1x Micro USB3.0. 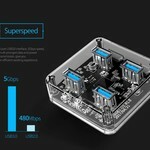 ✔ Transfer speed: SuperSpeed ​​5Gbps. 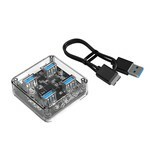 ✔ Compatible with: Windows XP / 7/8 / 8.1 / 10, Windows Vista, Mac OS, Chrome OS and Linux. ✔ Conform: CE / FCC / RoHs. ✔ Cable length: 30 cm. 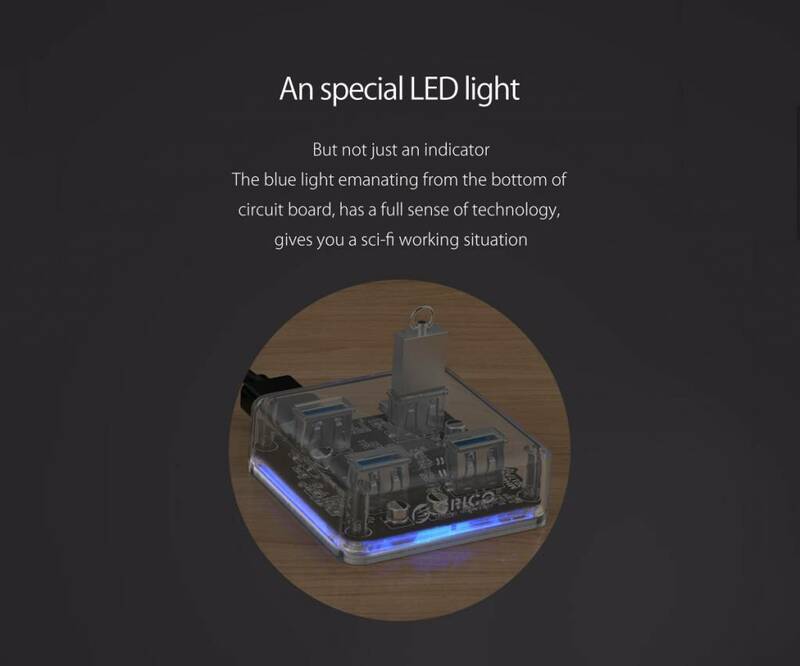 ✔ Product dimensions: 56mm x 56mm x 20mm.